This is a little outside of my usual wheelhouse, but a friend of mine who worked for Elizabeth Esty’s dark horse congressional campaign in Connecticut’s 5th district emailed last night with some personal observations about the race. I thought it made for interesting reading, so here it is. Enjoy. financial detail was that the Estys took out a $500K loan on their house for backup campaign funds. Even for a two-professional household, that is a lot of skin to put into the game. I only spent a few afternoons as a campaign foot soldier, but it was instructive. Out in the neighborhoods, most people are not home, so you leave a flyer. Even if the voter is home, he or she often doesn’t want to talk with you — an attitude that I totally understand. The people who want to talk, however, express a sort of desperation with the mess that U.S. political governance has become. Many of these people have lost their jobs, or have close friends who lost their jobs, and they can’t see a way out of the stagnation. It’s pretty clear that the Romney/Ryan economic plan won’t persuade these people, but the Obama campaign needs to express a countervailing vision to give these folks a reason to vote in November. I spoke with Daniel Esty at his wife’s election-night party and he echoed many of my observations about the 5th-District neighborhoods. Connecticut probably has more hedge-fund managers per-capita than any other US state, but it also has a significant manufacturing sector. Because manufacturing is ailing, there is a white working-class-male demographic that feels abandoned by the political system, abundant in the central-CT cities of Waterbury, New Britain, and others. Esty remarked that these cities are distressed and economically poor, but my impression was not as pessimistic, based on the streets that I walked. I walked far fewer streets than the candidate’s husband, of course, but there is a tendency among suburban professionals to judge as economic failure anything less than a substantial raised-ranch manse on a wide leafy street, with the grocery store a three-mile-drive away. What I remember from New Britain were old neighborhoods with small post-WWII houses which the residents had worked hard to make nice. No signs of crime or unrest. 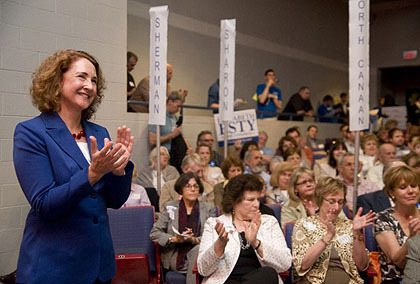 Elizabeth Esty won the nomination last night. For a person of my vintage, the 1970s movie The Candidate is the touchstone for moments like Elizabeth Esty’s election-night party. By 10 pm both competing candidates had conceded and the new congressional nominee came into the room in an electric-blue ensemble to give her speech. At such times one understands why political candidates amplify their plumage — she needs to stand out in a crowd of supporters. She paused, as though pondering putting her family through another three months of cold-pizza campaigning. But Romney/Ryan has given all Democratic candidates some automatic applause lines as footholds for their electoral climb. Esty finished her victory speech with decisive declarations that she would protect a women’s right to choose (she’s not supported by Emily’s List for nothing), protect Medicare, and protect Social Security. Much of the rest of the city is appallingly unsafe, with frequent violent crime. The truly lovely park, right beside the college, is also home to prostitution rings and vial-based drug dealing. (The weed dealer is one of our neighbors, in one of those those old neighborhoods.) The school district is crumbling, both from the weight of poverty and from middle-class flight. Our son is in the public schools, but most of the kids who would be his peers are in magnet schools in other towns or are in private schools or are home-schooled. The kids we see in the sports leagues often come from situations that would turn Paul Ryan into a socialist. We don’t like it when people from the snooty towns in CT look down at us without having lived here, because there are some nice areas in New Britain — but it is a city with terrible, terrible problems, with a massive number of distressed citizens. When Stanley and other manufacturers shut down the factories, the city started to collapse, and not much has helped it. No campaign visits the vast majority of the city, because the residents don’t vote, and it’s not safe to send people out. Obviously I didn’t intend to spark a discussion of the relative merits of New Britain, and I promise not to drag this out. But I figured I should at least air this dissenting view.